Who doesn’t love Mary Berry and The Great British Bake Off?! 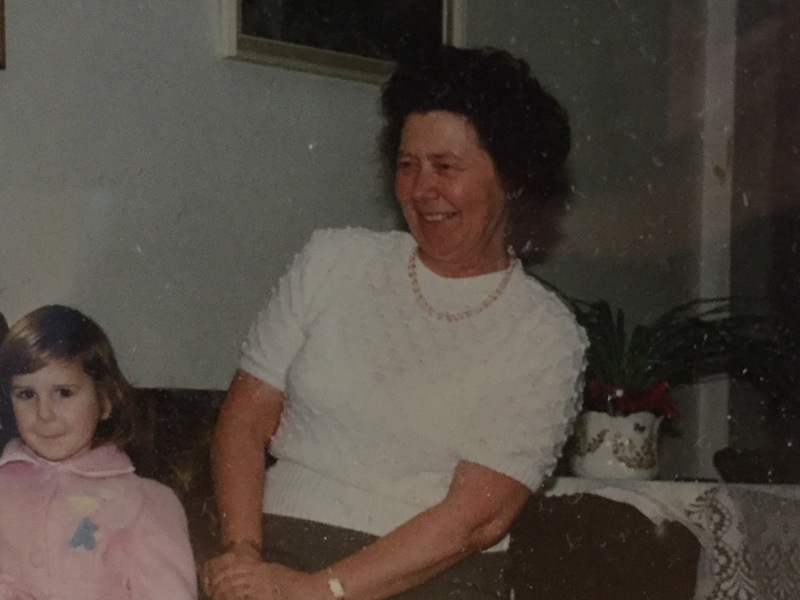 I’ve always watched the programme and enjoyed baking from a very young age, mainly due to my really rather marvellous Nanny, Eileen, who is much missed, every day. She was my Queen of Baking. Nanny Eileen and me (I think aged 4) at Christmas time. Precious memories. She would bake at least 3 times a week and her classics were shortbread fingers, Viennese Whirl Cakes (with a blob of strawberry jam in the middle that had the ability to glue your mouth shut, yum!) and Coffee and Walnut cake. That’s still my favourite cake of all time. So, in honour of my Nanny Eileen, I shall endevour to share the love of baking she gave me with my kids. It’s a tough act to follow, and I fail very often, but I enjoy it and the kids are very forgiving. If it was meant to be a 3 tier chocolate ganache cake, but it ended up flat and looking like a cow pat, they won’t care. As long as it tastes good, they’ll tell me well done. I’m a complete novice, I’ve never attended a workshop or course and mainly watched too much YouTube in the vain hope my cakes would turn out like the ones in the videos! But you know what, I have a go. So, get those Pinnies on and find your weighing scales! It’s time to get your bake on! 1. Sift the flour and a large pinch of salt into a bowl or food processor. Add the butter and rub in lightly with your fingertips, or blitz in the food processor, until the mixture resembles breadcrumbs. Incorporate the cheese, then bring the mixture together with your hands, or briefly process to a soft dough. Wrap in cling film and chill for 30 minutes. Heat your oven to 200°C and lightly butter 2 baking sheets or line with baking parchment. Put the dough onto a lightly floured surface and roll it out to a 5mm thickness. Using a 5cm biscuit cutter, cut out rounds and put them on the prepared baking sheets, leaving plenty of room for spreading. Bake for 10 minutes or so, until spread out and lightly browned at the edges. Watch carefully, because these biscuits colour quickly. Grind some salt and pepper over them and leave on the baking trays for a few minutes to firm up slightly, then slide onto a wire rack. Leave to cool. 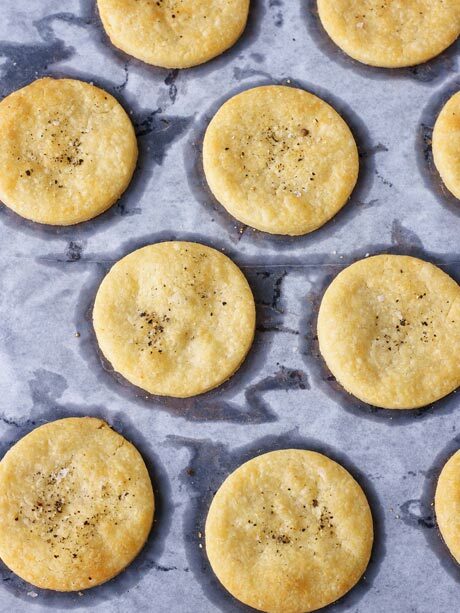 Store the biscuits between layers of baking parchment in an airtight container and they will keep for a couple of days. 1) Make a basic vanilla or chocolate sponge in a square tin. I did chocolate. 2) Keep baking square sponges until you have accumulated enough to make the number of blocks you need. I made 2 large square sponge cakes which gave me plenty. 2) Leave to cool and then cut into either squares or rectangles, depending on which Lego blocks you want to make. 4) Cut each block in half and fill as you desire. I did chocolate buttercream. 5) Crumb coat your blocks with the remaining buttercream and leave to dry. 7) Get some roll out icing in colours of your choice, I did primary colours but anything bright would look fab, and roll out to cover each cake block. 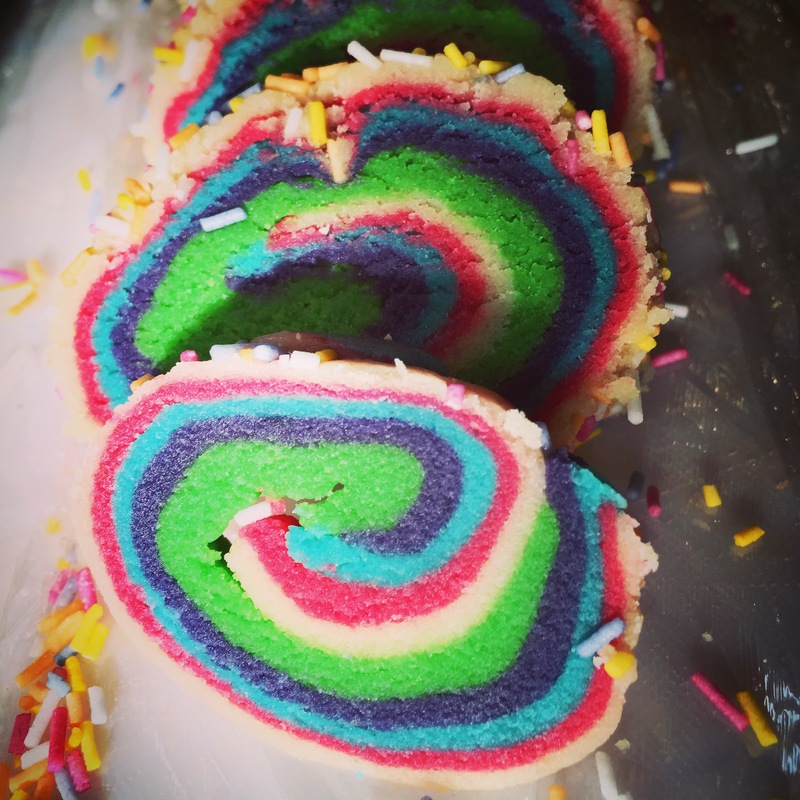 8) Once the blocks are covered, cut out some circles from the leftover roll out icing with a circular cutter (or a tumbler normally used for gin drinking!) and stick them on the top of your blocks to make the ‘connector’ parts of your Lego blocks. 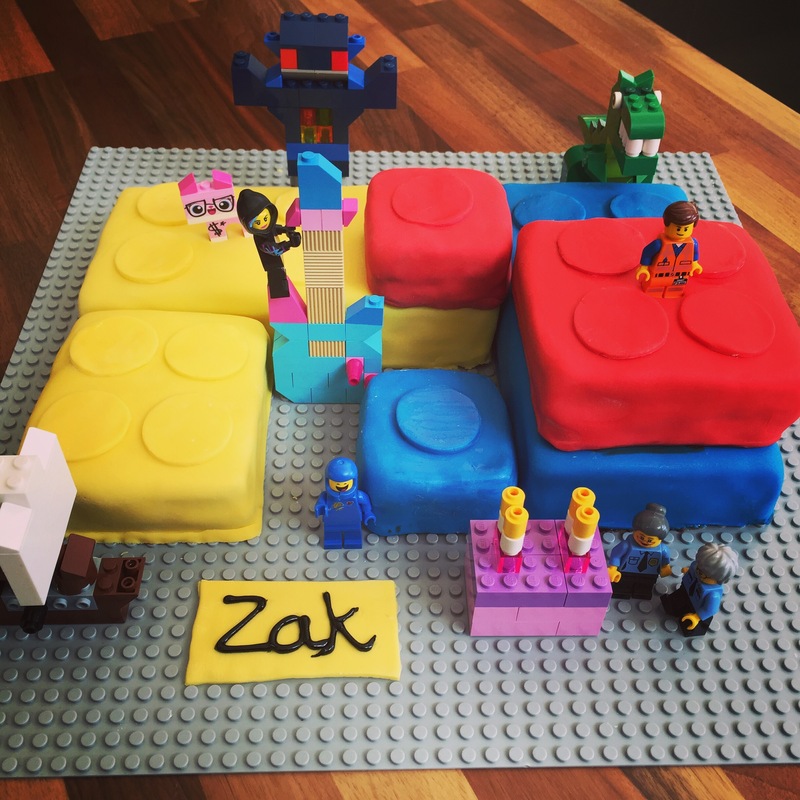 9) Make a load of Lego models with the kids and cover the cake in them to make the cake look more impressive than it actually is and hide most of the imperfections. 10) Pour yourself a G&T and pat yourself on the back. A traditional fruit cake, made back at the start of November so it can be fed at least 6 weeks of alcohol. Yum. Yum. 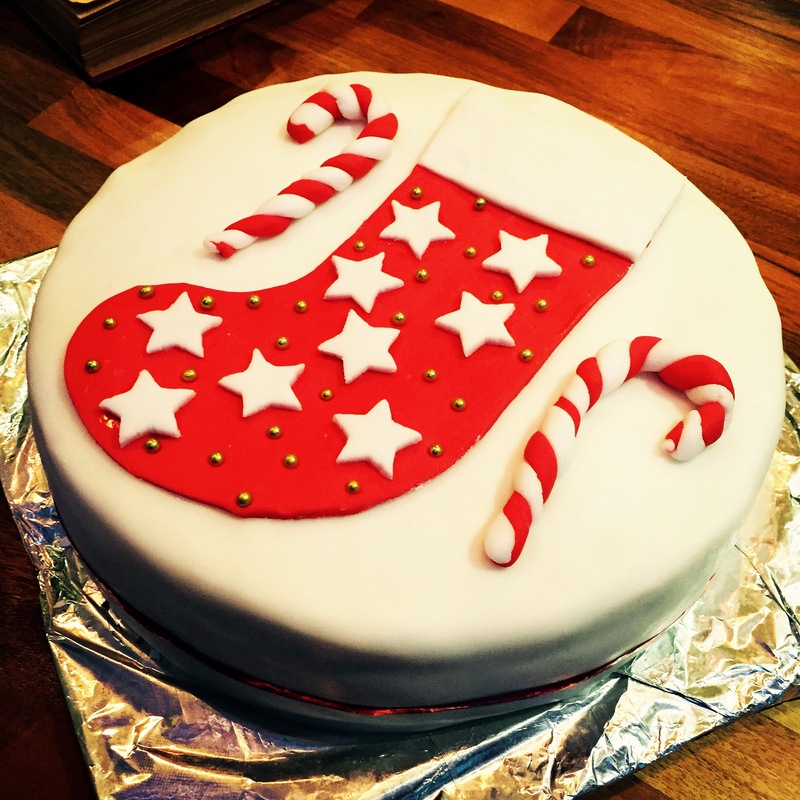 Decorated with a candy cane and stocking design. Again, sodding Pinterest. It looked bloody amazing on there and dead easy to do. 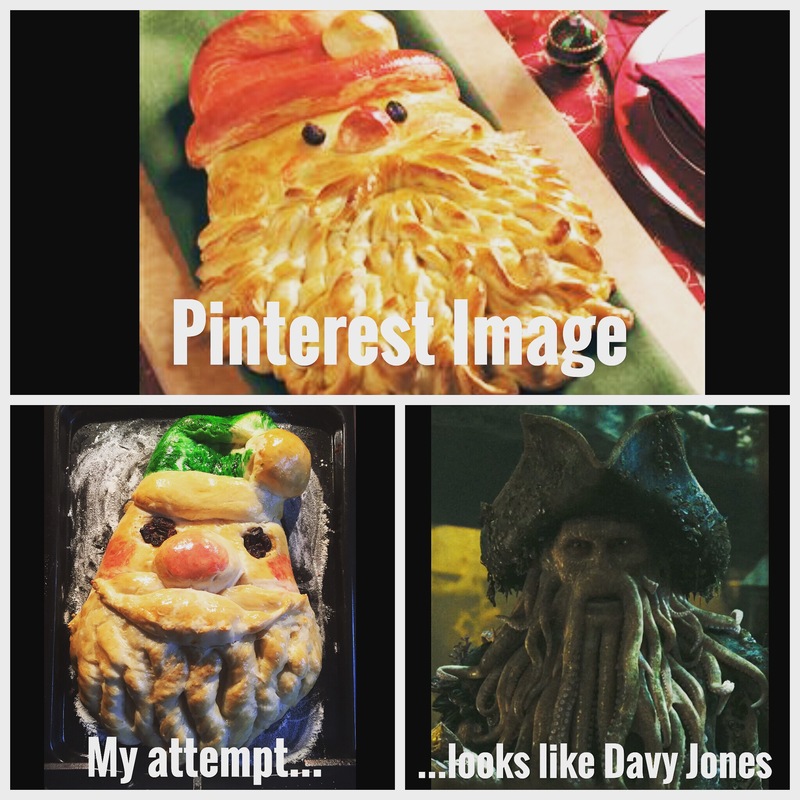 Sadly my attempt looked more like Davy Jones from Pirates of the Carribean. He tasted ok though…that’s lucky! It was just a basic white bread dough (from BBC Good Food Website) and shaped using a guide on Pinterest. Obviously I should’ve read the guide a bit more. Ho Ho Ho! Our first attempt at an entirely homemade gingerbread house. 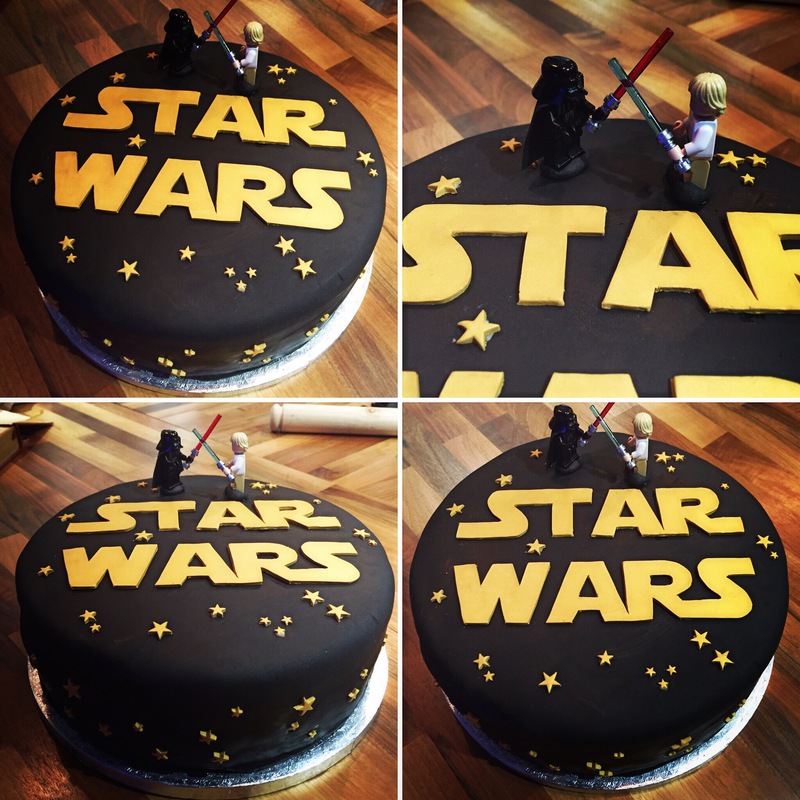 A birthday cake I made for my eldest, Luke, who is Star Wars mad (thanks to Daddy) and asked for me to make him a Star Wars themed cake. I’m not the worlds best baker, and I find the decorating part Gin enducing, but I had a go and homemade always tastes better than shop bought I think. I filled it with the usual Vanilla Buttercream (recipe also in the book I’ve mentioned) and Raspberry Jam. Yummers. I kept the design simple, but I think that it looked effective nonetheless and I didn’t have a mental breakdown trying to made a 3D extravaganza (my son had requested a 3D R2-D2 or Death Star cake but I gently lowered his expectations and he settled for a logo cake). 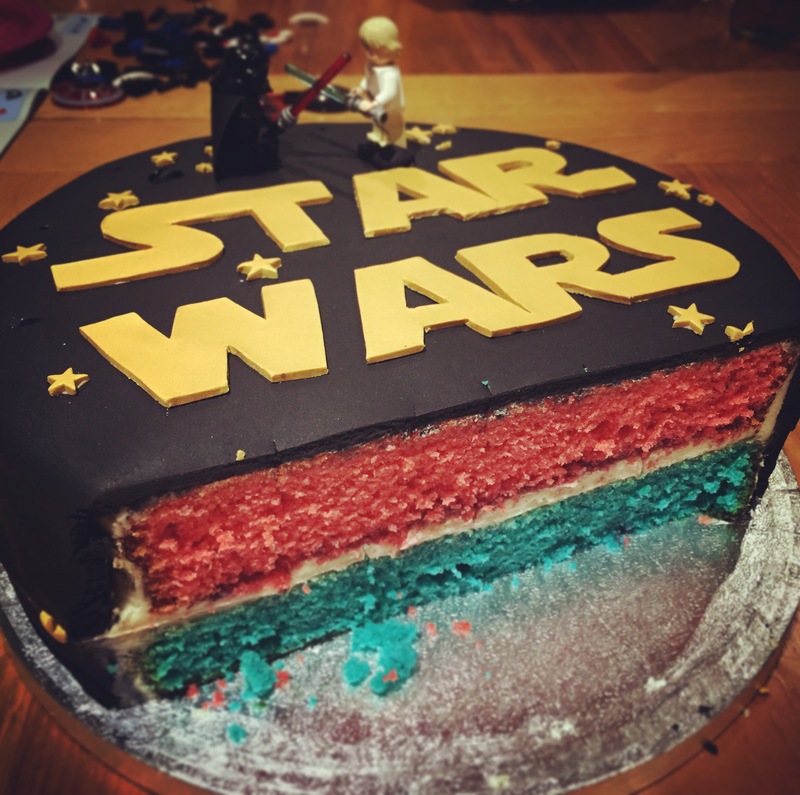 I coloured the sponge inside both Red and Blue to represent the Dark Side (Kylo Ren/Darth Vader) and the Jedi/Rebellion Side (Luke Skywalker/Rey). The icing I bought was already coloured black to save my sanity and the gold stuff I used for the logo was special modeling icing which I bought from an online cake supply shop. It is much easier to work with than normal roll out icing if you’re doing fiddly stuff. To do the logo, I printed off the Star Wars logo onto some paper and cut it out. I rolled out the modeling icing and put the template letters on top of it and cut around them using a very sharp crafting knife (which I only use for baking). It ended up tasting pretty good and my son was over the moon (and the stars…see what I did there?!) with it so that’s mission accomplished for another year…for the eldest one anyway! One drawback of having 3 kids is that you have to repeat this process 3 times each year! I made these as an alternative/interesting bake for the School Tuck Shop. I know they look like they’re full of E-Numbers and sugar (that’s because they are) but that’s the whole point of Tuck Shop! 600 children bouncing out of school full of icing and sprinkles causing chaos. There’s nothing like it and it’s what childhood memories are made of. Not the prettiest of things either but my kids loved them and claimed their friends did too. I coloured each bit of dough the desired colour, and took my first coloured dough and rolled it out into a long rectangle. I then repeated this with all the other dough colours and, once finished, layered them all on top of one another. I then rolled these stacked doughs a bit flatter so I could roll them into a long sausage shape. I wet the outside of the long dough sausage with a little water and rolled it in sprinkles so the entire outside was covered. I then wrapped in cling film and chilled it for an hour. After an hour, it was chilled enough to cut into 1cm slices with a very sharp knife. I then put 5 at a time on a baking sheet with greaseproof paper on and baked them at 190’c for 12-15 minutes. They firm up as they come out of the oven and cool so don’t be tempted to leave them much longer. And there we go! Some Garish and sugar laden treats for the school bake sale. Get in my belly!! ….I settled for a plain/vanilla cake with the traditional vanilla buttercream and Raspberry Jam filling. 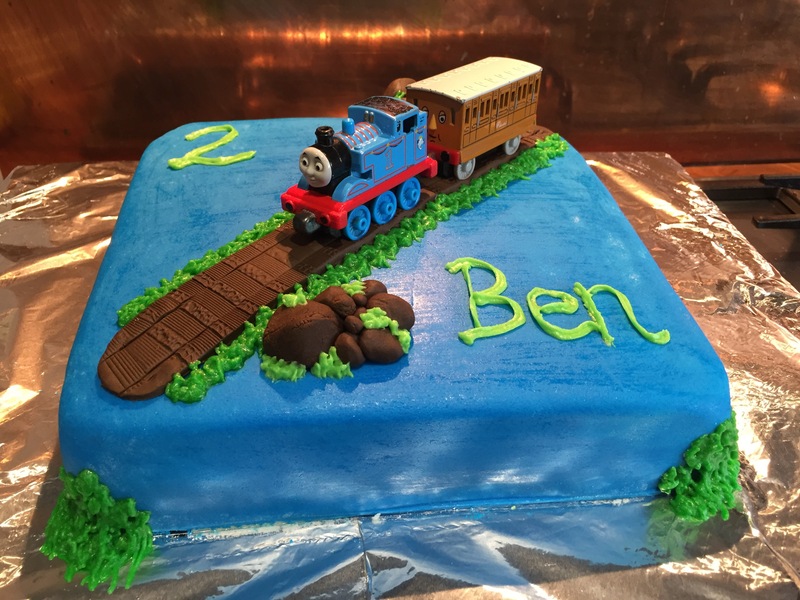 I covered it in Thomas Blue Icing and made a piece of track using some brown roll out icing and then pushing a bit of our train track from the toy box into it to get the print to transfer onto the icing. I then cleaned a Thomas Toy up and stuffed him on the top too. To finish i piped some green buttercream on around some rocks (which looked like poo, literally looked like rabbit droppings) and the track to hide some imperfections and make it a bit more interesting. Cookie dough, cuddling around a Mini Creme Egg, Covered with drizzled chocolate. What’s not to love?!?! I saw this recipe over on a blog called, She Who Bakes which is written by a lovely lady called Britt. She hit rock bottom a few years ago and contemplated ending her own life but, thankfully, she has managed to turn her life around (and some!!) and has now started a super successful buisness and website. She also has a fab, unique style! Lovely lady. You can find the recipe for these bad boys over on her website by clicking the link above. Get these in your life…and then in your belly! We love a cookie in this house, espicailly the gooey, squishy ones you get from Millie’s Cookies here in the UK. Here is a recipe we tried out that gave us pretty yummy cookies, with results almost like the ones we love from Millie’s! You can find the recipe in a blog post HERE! I love Cadbury’s Crunchies. Normally I like to nibble the chocolate off the outside first and then eat the honeycomb, just to make it last a bit longer! I may be a mummy now but some things never change, and how I eat a crunchie is one of them! And now my kids do it too! You can find the recipe for my own, homemade, honeycomb with chocolate, here. It’s simple enough but the sugar and syrup mixture does turn quickly so keep an eye on it before it burns! These little poop dudes are so much fun to make…and the kids loved eating them! Who wouldn’t find it funny eating a poop?! You can find the recipe for these chaps in my blog post, here. A recipe I did for the Queen’s 90th Birthday Celerations combining my two main loves…Gin. And Cake. 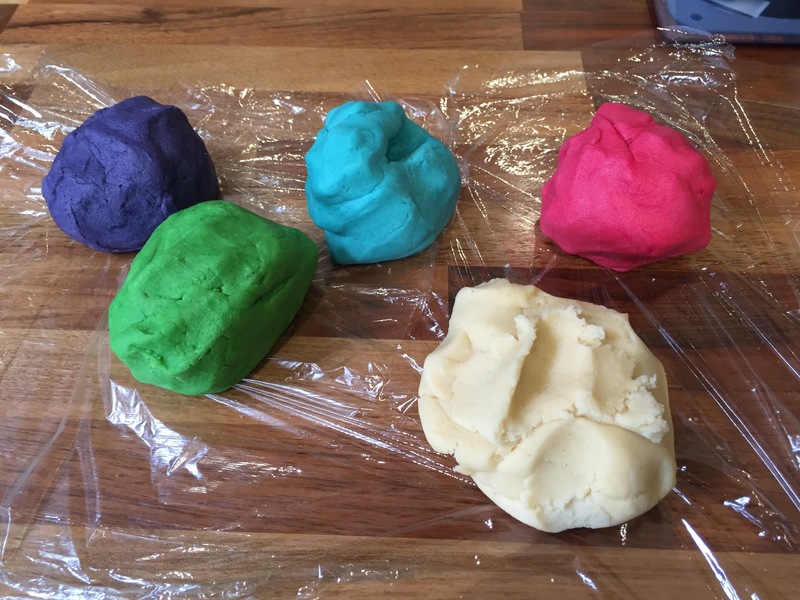 The Pokemon Go craze is in full swing here in the UK (Summer 2016) – here is a recipe for making Poke Ball Biscuits! 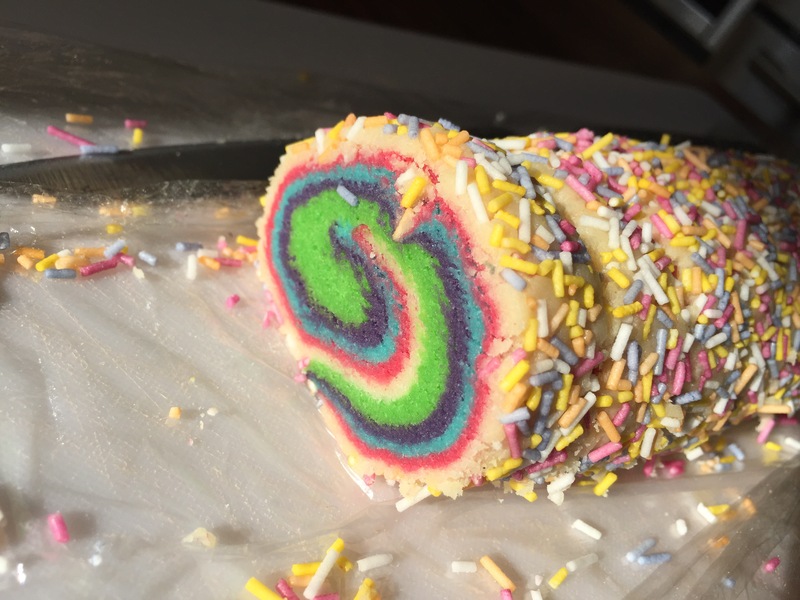 A fab idea for kids parties, as a summer holiday bake idea with the kids or just because! I was asked to make a cake for a couple of mummy friends from school, for their birthday’s. I was super nervous as I only bake for my very forgiving family and close friends, but I took the plunge and it actually came out alright! They asked for a Red Velvet cake, one of my faves, and so I diligently set about mixing and colouring my hands red! It’s a super moist cocoa/vanilla sponge (the sponge has buttermilk in) and the icing is a carrot cake-esque cream cheese one. So delicious! The recipe is from my favourite baking bible, The Hummingbird Bakery, Cake Day’s. The recipe for this red Velvet cake can be found in the above book, or a similar one is on the BBC Good Food website. I made these shortbread rounds using my nan’s handwritten recipe book. To change them up a little, I added some Rose Water to the mixture which gave them a slight floral taste and reminded me a bit of Turkish Delight, one of my nan’s favourite things. Not my finest attempt at a cake I have to admit. I copped out of making the Pikachu out of icing, instead opting for a toy on on the top of there, but my 7 year old still loved his Pokemon cake. I coloured the icing blue but left it ‘swirly’ like a whispy sky and I used some star cutters to make the little icing stars. The cake recipe was just a basic vanilla sponge from my Hummingbird Bakery cookbook which is my go to favourite. 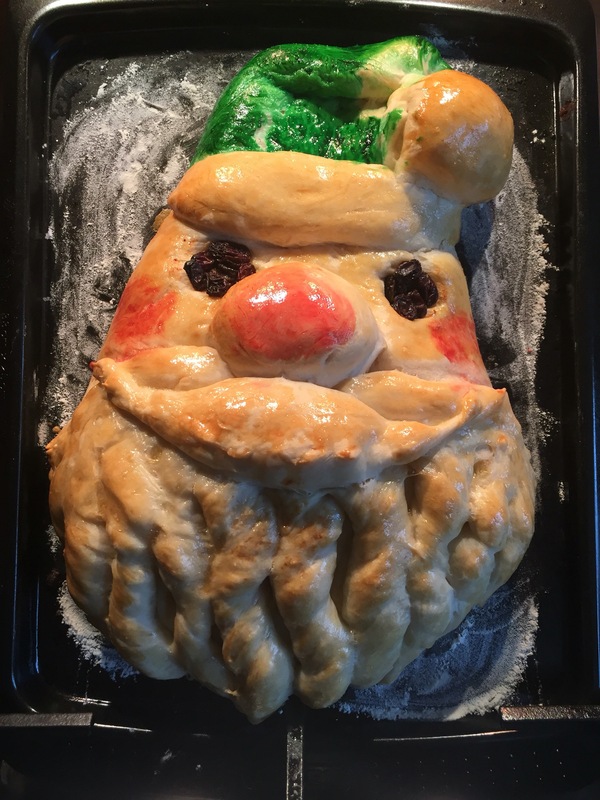 It was really delicious, despite the fact I made it and I just did a simple design of a Gingerbread man on the top using some leftover fondant icing and I popped a candy cane in his hand. Not elaborate, but made with love. These crackers were a guest post by a lovely lady called Supriya. She writes over at a blog called Quichentell. You can find the recipe for these wholesome crackers here. These muffins are super simple to make. They’re perfect for a breakfast on the go or for a healthier sweet treat in the kids lunchboxes. Follow my video tutorial for how to make them! This Gin & lemon syrup is perfect for drizzling over pancakes or even over a Lemon Drizzle cake for a grown up twist! I cannot wait to have my pancakes on Shrove Tuesday with this delicious stuff on. This cake was made by me for my eldest son’s (Luke) 9th Birthday. He is Pokemon mad but, being a homebaker, I am not capable of making the creatures out of icing by myself. I went on the internet and found a lady on Etsy who makes rice paper Pokemon decorations so I ordered some and I also bought some rice paper grass to decorate the edge. The cake itself was a plain vanilla sponge but I coloured one layer red and left the other plain. The icing inside was vanilla butter icing which I coloured black (not very appetising to adults I know, but the kids loved it!). Once the cake was assembled, the sponge and icing looked like a Poke Ball. Luke loved this little touch. The icing on the outside was just Green roll-out icing and I used a grass effect piping tip to decorate around the edge of the cake with some green buttercream icing. I tried my best to make 2 Poke Balls (an Ultra ball and a standard Poke Ball) and Luke’s name in Pokemon style writing out of icing to put on top of the cake. They came out alright really. Again, I just used roll out icing for these. A simple cake, but it was well received. A recipe for a simple, but delicious, Farmhouse Cake. Cinnamon and Raisins in a brown sugar sponge. Just perfect with a cup of tea! A childhood party favourite. Why not make your own so you can customise the colours to fit with your party theme? A simple but eye-catching recipe for a Fried Egg Easter Chocolate Slab. 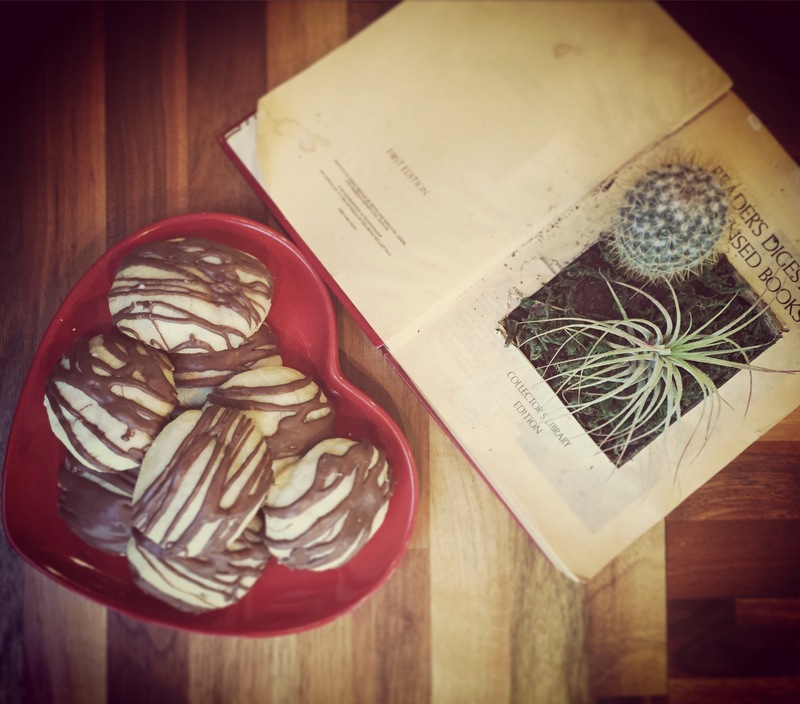 Make it and give it to a loved one as a gift or smash it up and scoff it yourself! One of my most favourite things to scoff, ever. I love shortbread, and chocolate, so the two combined is my match made in heaven. Perfect for a school bake sale, a coffee morning or to make with the kids. The sponge inside was a vanilla sponge, which I coloured pale pink, with vanilla buttercream which was coloured lilac. All the decorations were made either by hand, all using fondant icing, or with a cutter (flowers). I used some glitter spray for the fairy and her dress and added in a few garden critters to busy it up a little. I am reliably informed the little girl, Skye, loved it. Mission accomplished. This is a cake I made for one of my best friends, Kelly. It was her birthday and she made me a cake so I thought it only fair that I made her one. The sponge was lemon flavoured (naturally with lemon rind and a bit of lemon juice) and the filling was lemon flavoured buttercream (again using the rind and some juice) and lemon curd. I decided to have my first ever go at a drip glaze. It was, in hindsight, a little thick and I need a much taller cake next time for the drip effect to make it’s maximum impact, but it wasn’t a bad first try. The meringues on top are pastel coloured rainbow swirl ones I made using some food colouring and the little ones are the same mixture but I dripped them in some melted white chocolate and then into sprinkles. I got to taste this one and it was pretty good, even if I do say so myself! These simple oats are a deliciously filling breakfast option. Not at all sweet, and perfect served warm with some vanilla yoghurt on top. You can find the recipe here. This coffee and walnut cake was made by me for a friend of my mum’s. One of her work colleagues was leaving for pastures new after 14 years and we thought we should do something for him, so I made this and dropped it in to him. The sponge was coffee and walnut and the buttercream was coffee floavoured. I tried to make it look a bit different/special by decorating it with some meringues, ferrero rocher and gold glitter spray. I was told that it tasted nice – phew! These biscuits were made for the school tuck shop (basically a cake sale where the kids can choose a couple of cakes at the end of each half term). I was in a rush so they aren’t as neat as I’d have liked, but they came out ok and tasted pretty good. I used the same recipe for these as I did my Pokemon Pokeball Biscuits, the only difference is the colours I used for the icing. This was my first ever attempt at a cake which wasn’t flat. A ‘3D’ cake if you will. Ben was, and still is, obsessed with a Norwegian programme called, Fergie the Little Grey Tractor. It’s a bit like Brum from the 90’s if any of you remember that, just with a tractor. He watches it allllllll the time! Anyhow, this was my attempt at making Fergie for him. I was, for once, pretty proud of myself for managing to make something like this and not swearing too much in the process. The cake was essentially a large square one and a rectangular one which I cut up into various shapes to make the tractor. I then slathered it in buttercream and icing and hoped for the best! The sponge and buttercream were both vanilla on this one with some raspberry jam too. Ben was over the moon with it. This is the first ever time I have made a person from Icing. A few YouTube tutorials later, I had a go and I am not ashamed to admit my first try was awful and it ended up in the bin. This was my second attempt and, though not perfect, I was much happier with how it turned out. The cake and buttercream were both chocolate on this cake, Chris’ favourite, and all the decorations were handmade using fondant icing or buttercream (grass). The worst part of the whole cake was the bike!!! I made 5 in total and all of them, including this one I put on the cake, broke. I managed to stick this one down in a fashion which made it look complete thankfully but it was very stressful. 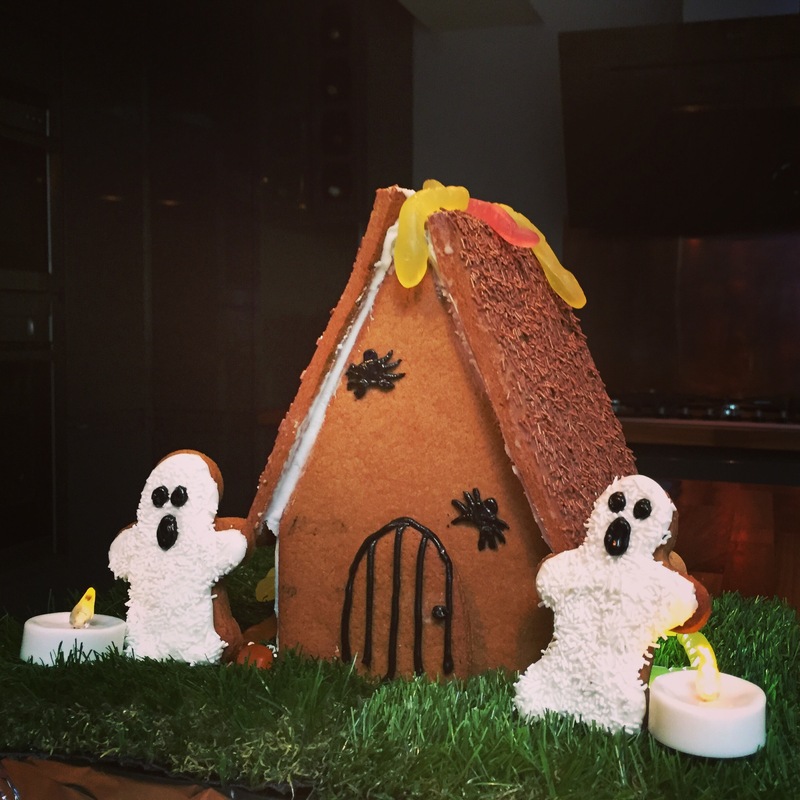 I didn’t use any cocktail sticks in it, it’s all edible…and fragile! Haha! A few weeks after making Ben’s Fergie cake, I was asked by a family friend if I could make their Grandson a John Deere tractor cake. I was petrified to say yes but I gave it a whirl and, amazingly, it came out alright. 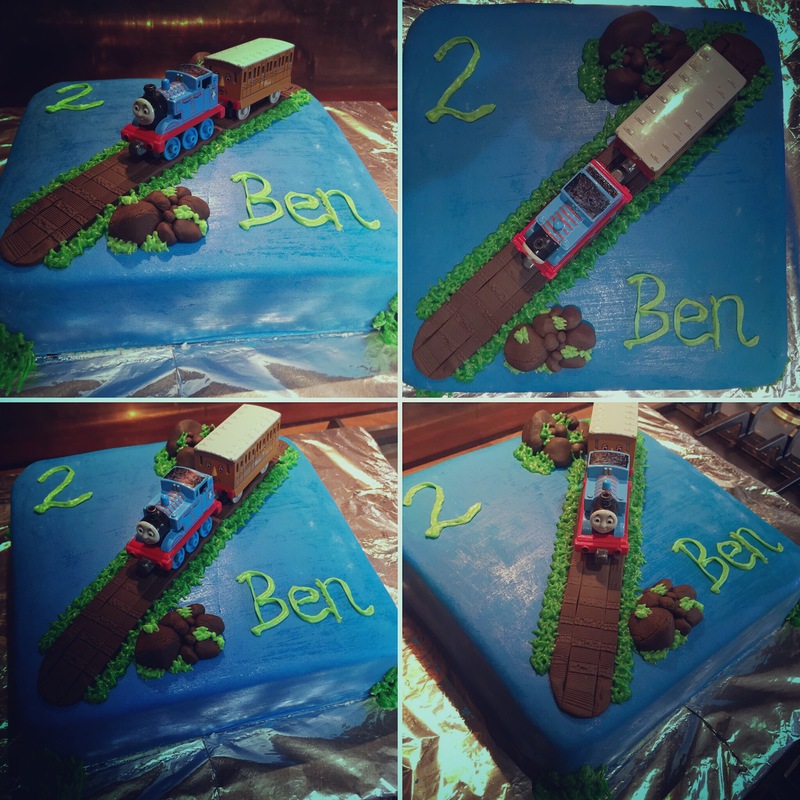 This was better than Ben’s in the respect that I made an actual cake for the tractor to sit on, they needed a large cake to serve everyone at their party. It was plain vanilla sponge with raspeberry jam and vanilla buttercream. I made the tractor in the same was as I did the Fergie one but added a square top to make the cab and I also had a go at making some animals from icing, which I have never done before. They were quite cute really, and the boys loved the cow pat I made for the cow! Haha! These cookies are super delicious and really easy to make. You can find the recipe here.